Four Girl Scout Troops Earn Chesapeake Chapter Scout Patch – Chesapeake Chapter U.S.L.H.S. 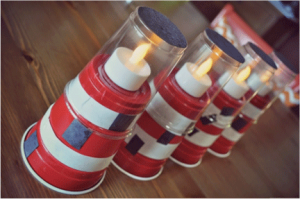 This quarter we celebrate four Girl Scout troops who earned the Chesapeake Chapter, U.S.L.H.S. “Keeping the Lights Shining” Scouts Patch! Cadette Troop 80294 and Senior Troop 80295 from Gettysburg, Pennsylvania, eleven girls and their leader. Junior Troop 81537 and Brownie Troop 81799 from Urbana, Maryland, fourteen girls and their leader. 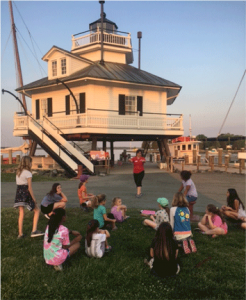 The girls, led by Stephanie Brady, earned their patch by completing five activities and participated in the lighthouse overnight program at the Chesapeake Bay Maritime Museum. The scouts: Juniors – Aine Taylor, Lily McKay, Maggie McKay, Keira Mistry, Gemma Gibney, Bella Rattie, and Gaby Mundo. 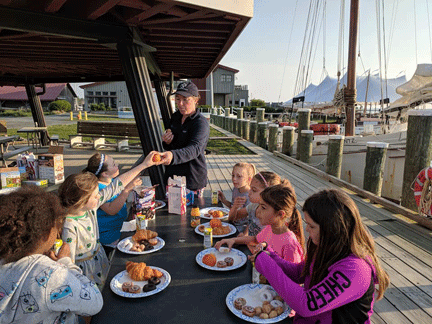 Brownies – Saoirse Taylor, Isabella Varesco, Madelyn Dame, Caroline Pettay, Maya Pierrelus, Hannah Wright, and Tate Bailey. See the article and photos they provided below. 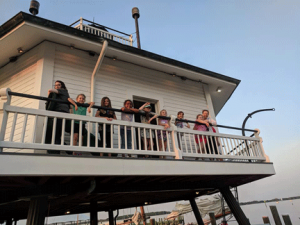 Two Girl Scout Troops from Urbana, Maryland, 14 girls and seven parents, planned an overnight excursion to the Hooper Strait Lighthouse as part of earning the Chesapeake Lighthouse Badge. 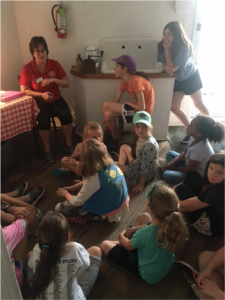 Prior to the trip, the girls spent a meeting with the older girls (5th grade) teaching the younger girls (2nd grade) about lighthouses, life of a keeper, and building a lighthouse craft together. They were all ready to go for their big overnight trip! 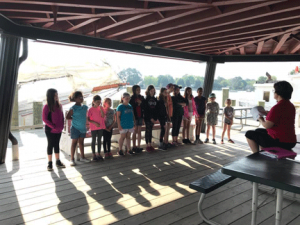 Our Junior Troop #8 1537 and our sister Brownie Troop #81799 went to St. Michaels, Maryland last month as part of our lighthouse badge. We learned how to be lighthouse keepers. We started from Urbana, Maryland and drove for a couple of hours and crossed the Chesapeake Bay Bridge to get there. Once we got to the location, we met our tour guide, had some dinner and played on a boat that was on the land. 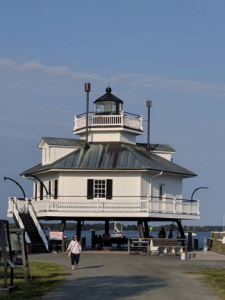 We went to the Chesapeake Bay Maritime Museum and got to stay overnight in the Hooper Strait Lighthouse. 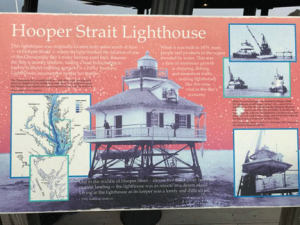 The lighthouse was moved from its original location in 1965 to Navy Point where we visited it. We got to eat under the lighthouse that was on the ground with a great view looking out into the Chesapeake Bay. After that, our guide talked to us about the type of lighthouse we were staying in, how it was made and all the history about the lighthouse. The type of lighthouse that we were staying in was called a screwpile. It was called that because it had a giant screw at the bottom which was holding it into the ground. Then we got a tour of the lighthouse and learned about how lighthouse keepers lived back then. Once it got late, we headed to bed. The best part was that we got to sleep inside of the lighthouse. Inside of the lighthouse it was very hot, humid, and muggy so we put out many fans, and left the door open to help keep the lighthouse nice, comfortable, and cool. The next morning, we got up, ate breakfast, and then once we were done with our breakfast we all gathered underneath the lighthouse and our tour guide gave us our lighthouse badge for our vests/sashes along with a certificate stating that w e were now lighthouse keepers. She also made everyone say the oath to become a lighthouse keeper. After we did that, we packed up all of our belongings and packed them up into the cars. As Girls Scouts always do, we cleaned up the lighthouse better than we found it. After that, we thanked our tour guide and headed to different buildings to see different things and we got to go oystering and put out eel and crab traps at the museum. We then went out to the city to give local business owners, and people working in the city, Girl Scout cookies as a random act of kindness. Once we handed out all the cookies, we went to an ice cream shop and got ice cream as a treat. After that, we headed back to our cars to start heading home because it was a long drive back home. Everyone in my troop can all agree that it was a very enjoyable overnight stay at the Hooper Strait Lighthouse.